Tamahagane Kyoto San Series of KnivesTamahagne is a new brand of cutlery that derives its name from the rich Japanese tradition of sword making and the intricate layered steels involved in the process.The 63 layer Damascus style blades of these knives are a 3-ply construction and are formed by repeatedly rolling three separate layers together to create highly specialized solid blade steel. The blade’s core is high carbon VG5 steel that has a Rockwell Hardness of approximately 59degrees - 60degrees . This hardness is a byproduct of the rolling process. The two outer layers are SUS410 stainless steel that provide strength and help keep the knife free of corrosion.This steel formation lends itself to an extremely sharp edge that has been finished to a blade angle of 14-15 degrees. These fine blades are fixed to a comfortable compressed laminate linen handle. The bases of the knives’ handles have been weighted giving the finished piece balance. 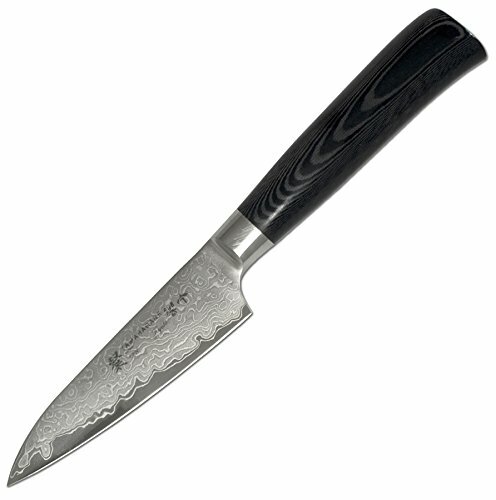 These knives are an excellent balance of tradition and technology.Paring Knife3.5 blade. If you have any questions about this product by Tamahagane, contact us by completing and submitting the form below. If you are looking for a specif part number, please include it with your message.